I honestly would have said that it was a Sauvignon Blanc. And that’s not a bad thing in my humble opinion. 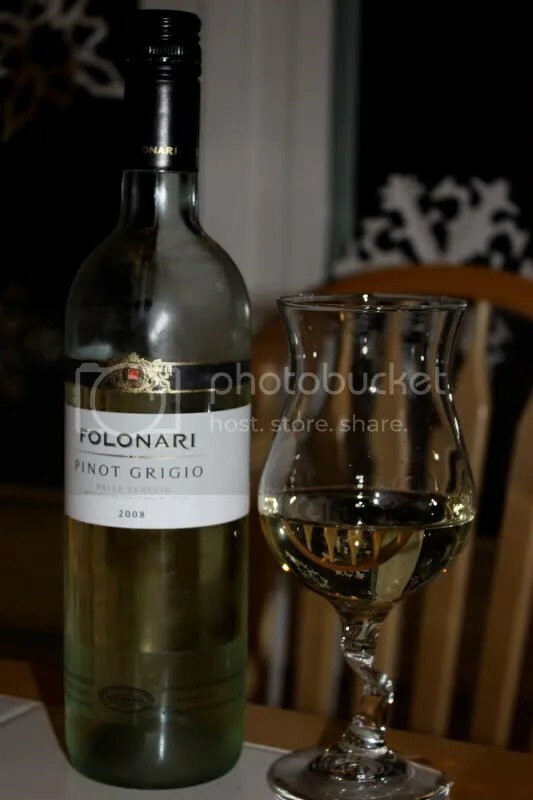 Often when I drink a Pinot Grigio my reaction is simply “meh.” Too many times they lack flavor and characteristic and just get lost in my mind in a sea of other bland, uninspiring white wines. Not so in the case of the 2007 Luna Pinot Grigio Napa. It had so much going on that I would never have pegged it as a Pinot Grigio. The Luna clocked in at 13.5% alcohol by volume, had a screw cap closure, and retails for around $15. On the nose I got lime zest, lemon, green apple, and peach. The fruit jumped out of the glass, especially the citrus, which seemed quite pungent to me. In the mouth the citrus flavors carried through and showed as tart and almost mouth-puckering, like some Sauvignon Blancs. I found lime, lime zest, lemon, and grapefruit. 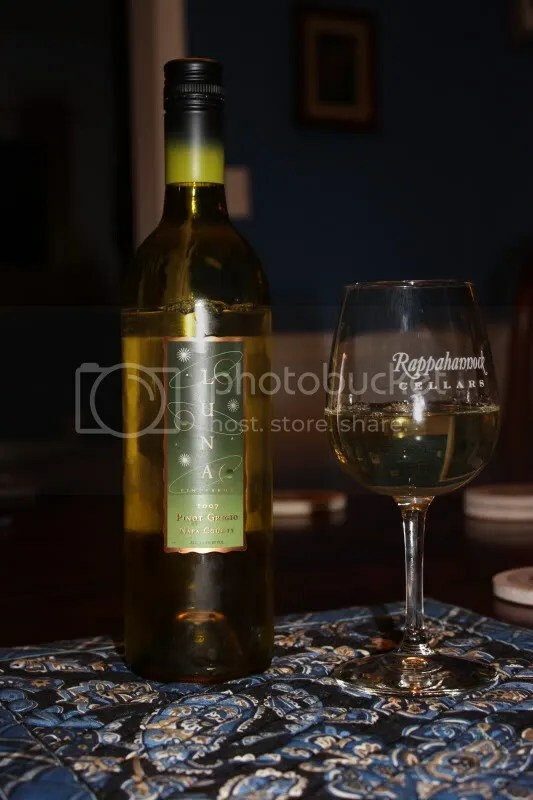 The wine had great acidity, was quite tart and refreshing, and had I not known it was Pinot Grigio I honestly would have thought Sauvignon Blanc. I seem to have misplaced my photos for this wine. I know I took them, I just can’t find them. If they reappear, I’ll put them up…I do have 3 cameras, so it’s possible they are on one I haven’t cleaned out in a while, but then you’d think I’d be missing others. However, that does not mean I didn’t like the wine. In fact, I rather enjoyed this bottle. 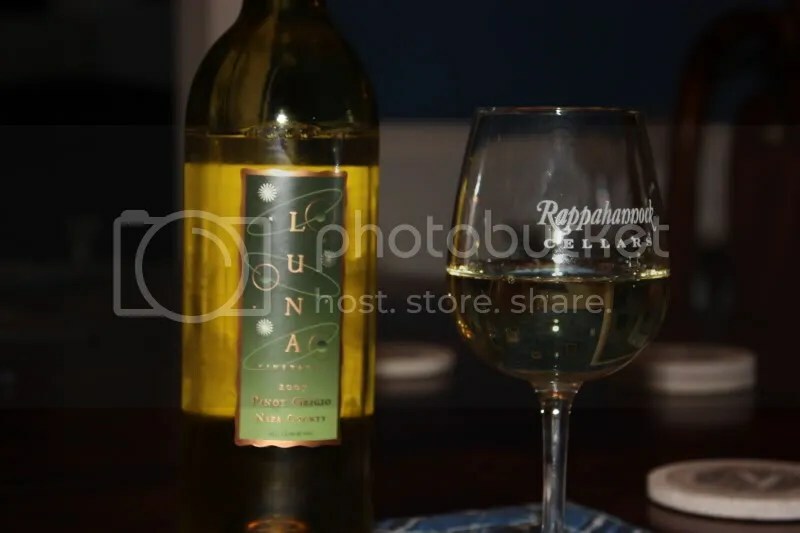 We opened up the 2008 Luna Pinot Grigio on a very hot DC evening. (Though lets be honest…every evening has been hot this summer…) It had a screw cap closure, clocked in at 14.1% alcohol, and I see it available online for as little as $14. One person has it for about $9, but I can’t tell what vintage that store is selling. If it’s the 2008, go, scoop it up, now! On the nose I got pineapple, apple, pear, peach, white flowers, and slight honey and melon notes. The mouth followed through from the nose (I’m pretty excited when there’s good follow through as there have been many times I’ve had a wine where I can’t believe what I’m tasting is the same thing I’ve been smelling) and had great acidity. I found peach, pear, melon, and honey. Light, crisp, and refreshing, all in a $14 (or under) package from Napa. Sold. *Disclaimer: I received this wine as a sample from Terlato Wine Group. Sorry for the radio silence for the last week or so. I was traveling to Philly and San Francisco for work and thought I’d have some internet access other than through my phone, but technological difficulties got in my way. Back on the horse now that I’m back home again. I’m done with business travel for the next year or so as well! Anyway, swimming in a tub of crisp, cool, white wine actually sounds a little bit like heaven on earth right now given the heat, humidity, and heat index here in the old D of C. Such a transition from high 50s-low 60s in San Francisco to step off the plane into 103 degrees with something like 70% humidity! 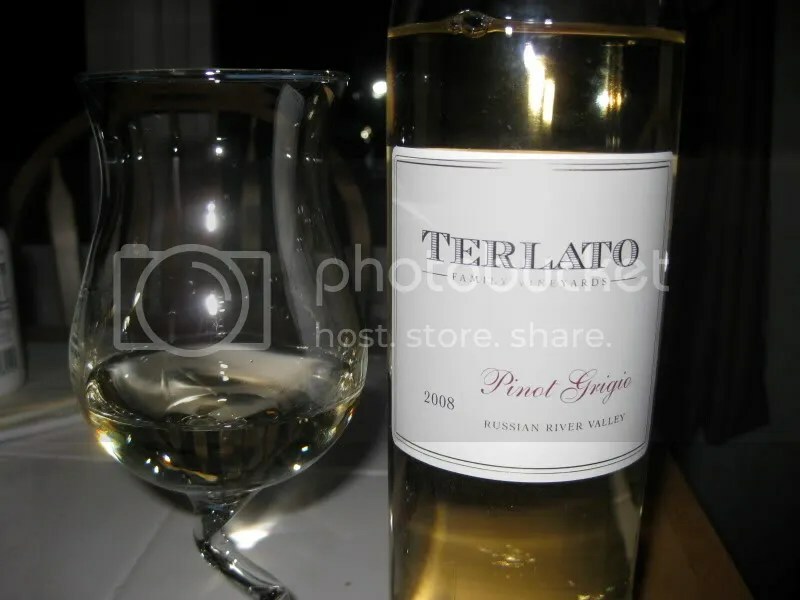 For a day like that, this 2008 Terlato Pinot Grigio made a perfect summer sipper. I see that 2007 retails for about $18-$25, so I gather this one was about the same, it had a real cork closure, and the bottle got pitched before I could record the alcohol content. On the nose I found the wine to be tropical, with lemon, pear, pineapple, melon, and florals. Overall, it’s a very aromatic wine, I could smell it across the room as Matt poured the glasses. In the mouth I found lemon, pineapple, tropical fruit, melon, orange zest, and orange. It was crisp and tingly on the tongue and made a great accompaniment to the DC weather. I’d like to see it priced closer to $14, though, inching up toward and over $20 is a little rich for me. *Disclaimer: I received this wine as a sample from F. Wildman. Now, this is what I like to see. And Pinot Grigio is often not my thing. But I’ll give credit where credit is due, and I see this wine available on sale online for $7 and a little pocket change. If $7 is your price range and you enjoy Pinot Grigio, this is the wine for you. 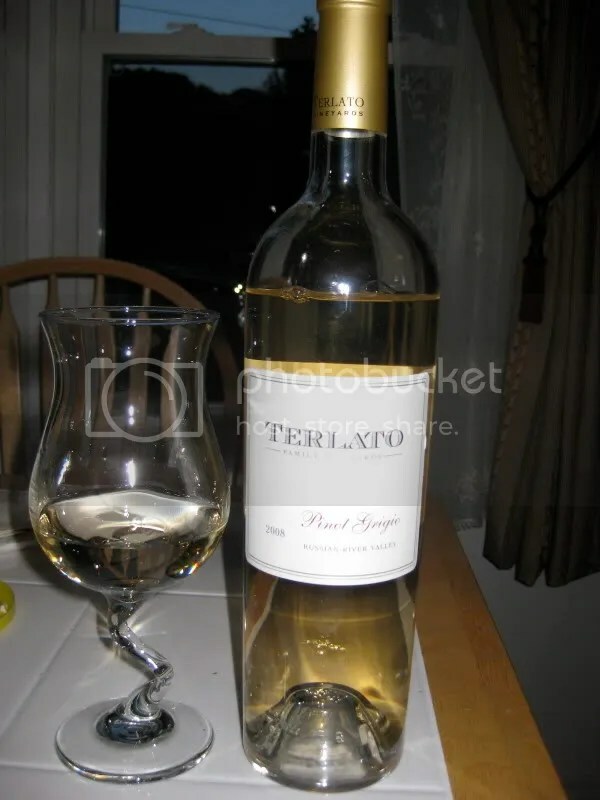 I have lots of family and friends who absolutely love Pinot Grigio. I would serve this to them in a heartbeat as a great, inexpensive example and hope to forever move them away from the 1.5L jugs they currently drink. 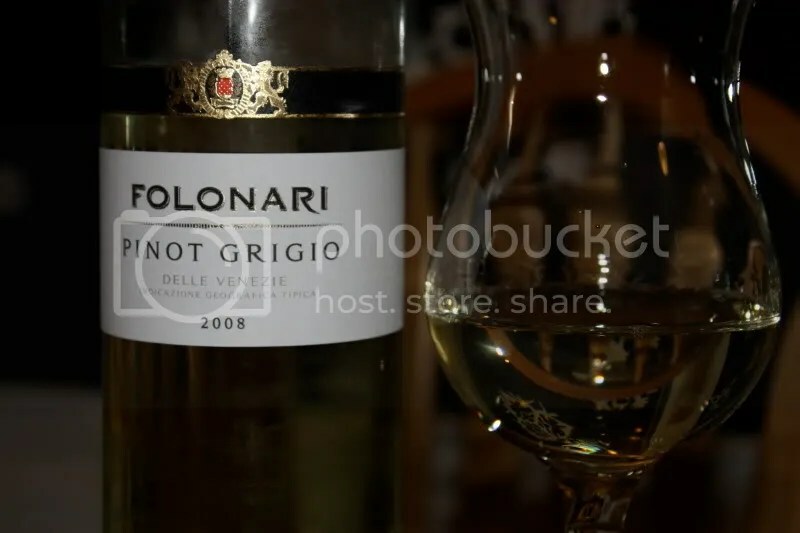 The 2008 Folonari Pinot Grigio is imported by F. Wildman, clocked in at 12% alcohol by volume, and had a screw cap closure. Even better! I can really imagine this being the poolside Pinot Grigio of choice. On the nose I found melon, citrus, lemon, white pepper, spice, and slight honey notes. The nose smelled clean and crisp to me. In the mouth, citrus dominated. I got lime, lemon, spice, lots o’ citrus, and slight melon notes. Overall, I found the wine to be very lemony. 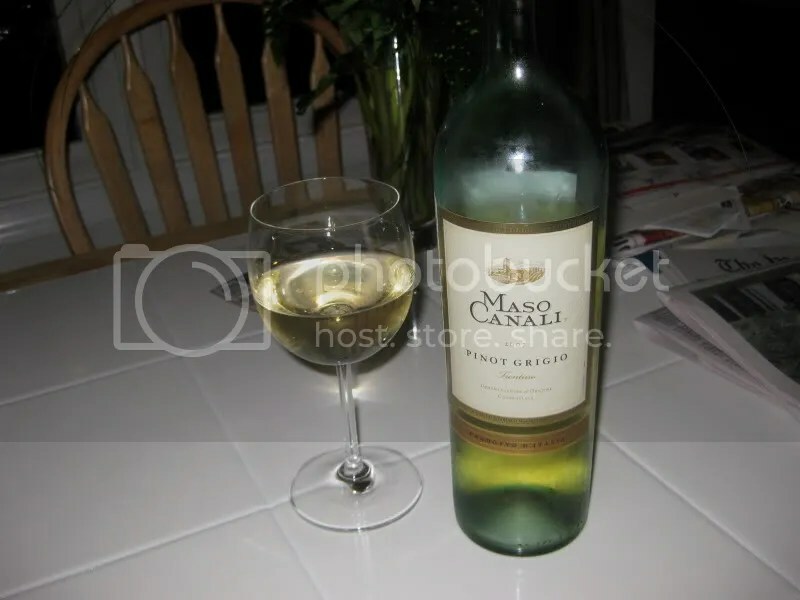 Refreshing, clean, crisp, and displaying typical Pinot Grigio characteristics all in a $7.19 bottle. I don’t drink much Pinot Grigio, if any. I bet I’ve reviewed less than 5 bottles of it since I started the wine blog 3 years ago. I tend to make the association between it and putting ice cubes in your wine to sip by the pool. That’s certainly not a fair assessment, but a lot of what I’ve had over the years is boring and flat. 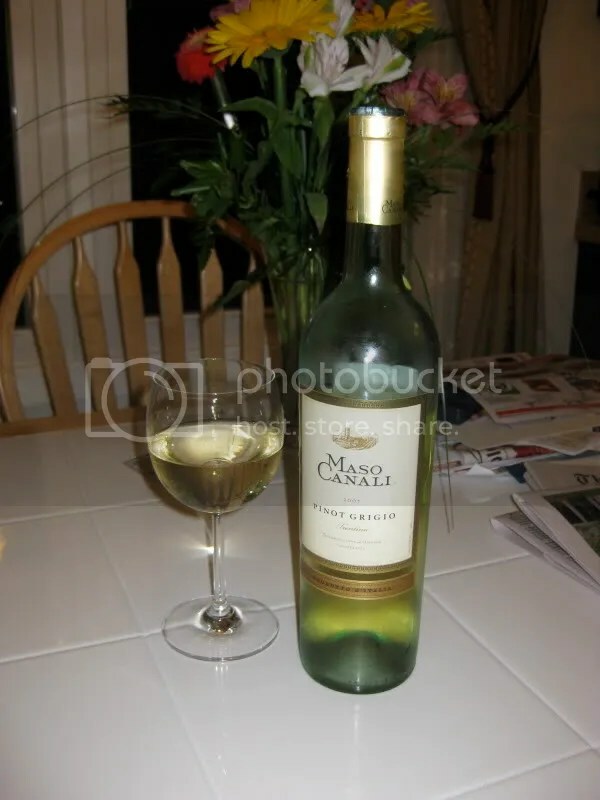 Tonight we tried the 2007 Maso Canali Pinot Grigio from Italy. It clocks in at 13% alcohol by volume and retails for around $16. Matt opened the bottle and I forgot to ask him what kind of closure it had. On the nose I found lemon, spice, and melon. It had a very faint nose. In the mouth I got lemon, tropical notes, melon, and citrus. Overall it was smooth and refreshing, very easy to drink. I’ve been friends on Twitter with stoc, or really Felicia, the personality behind STOC, which stands for “Sort This Out Cellars” for quite some time. Recently she tweeted about taking STOC on the road, and I wondered if they would be coming to Virginia, alas, no, but Felicia offered to send me my own personal “road show” to taste. 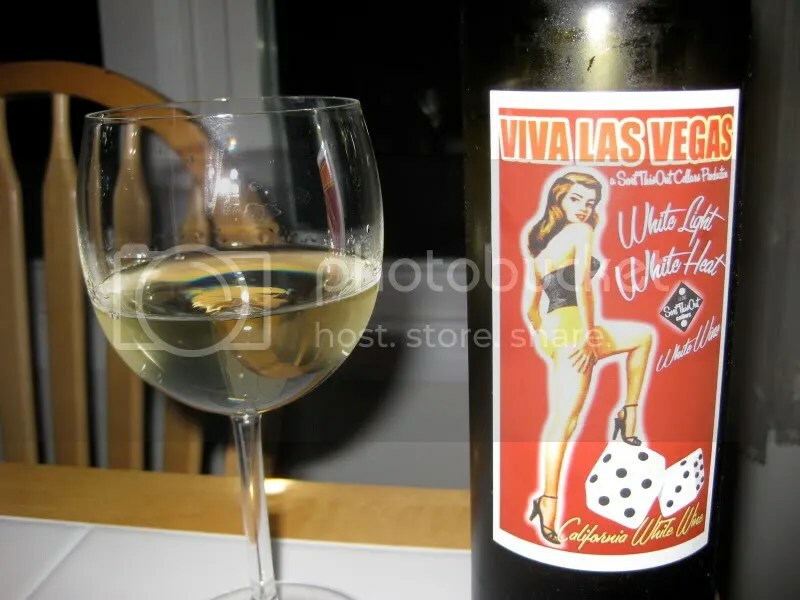 Among the wines was the 2006 Sort This Out Cellas Viva Las Vegas California White Wine. Viva Las Vegas White retails for $15, has a cork closure, and clocked in at 13.5% alcohol by volume. On the nose I found honeysuckle, white flowers, orange zest, golden delicious apple, lemon, pepper, and pear. In the mouth I got spice, pepper, apple, crisp pear, lemon, white pepper, orange, orange zest, and tangerine. I like the finish on this one. It struck me as clean and zippy. The Viva Las Vegas would make a great wine to enjoy poolside on a hot day. The wine for the evening was a 2007 Albino Armani Pinot Grigio. I picked this wine up at Total Wine and More, even though it was more than my $10 limit when I’m there. However, I tasted it while there and figured I’d bring a bottle home. The bottle clocked in at 12.5% alcohol by volume, had a real cork closure, and cost me $18. On the nose I found vanilla bean, lemon, pineapple, starfruit, and citrus. In the mouth I got citrus, lemon, and peach. There was also a hint a cream. The wine was light, lively, and had great structure. I’m not normally a Pinot Grigio fan, I tend to find on the lower end of the price structure that they are fairly flabby and uninspiring. So I was thrilled to find this one, which, with an $18 price tag is still in the budget and delivers a lot of bang for the buck. I’d definitely get this one again.